jOBS - the too cutely titled Steve Jobs biopic - is a ruthlessly efficient but frustratingly unenquiring film that is ultimately saved by the convincing central performance by Ashton Kutcher. Kutcher goes beyond his striking similar resemblance to adopt the loping walking and speaking style of the iconic computer developer, and allied with superb production design and authentic Los Altos locations, this make the film compelling despite its stylistic problems. These must rest with the director Joshua Michael Stern (SWING VOTE) and debut screenwriter Michael Whiteley.. To be sure, they don't sugarcoat Jobs - they show his immediate and early ripping off of fellow collaborators - his harsh rejection of his daughter - his frustrating single-mindedness - but they never investigate it. Why - on the first deal they did together - did Steve Wozniak (Josh Gad) off? Where did he get the drive and knowledge to cut such a financially astute deal with venture capitalist Mike Markkula (Dermot Mulroney)? Why did he cut out early collaborators such as Daniel Kottke (Lukas Hass) out of the lucrative Apple IPO? Why did he deny he was his daughter's father for so long? And why did he then recant? This latter issue is perhaps the most frustrating. In a movie that uses Jobs' eviction from Apple a major psychological turning point it's incredibly annoying to reunite with him a few years later where he's apparently turned into a doting father, husband and zen father. So if we're not getting psychological depth here, what are we getting? A fairly straightforward corporate history of Apple. It reads as follows. Woz is the IT genius who creates the PC but Jobs is the marketing and design guru who sells it to the financiers and then to Wall Street. His search for perfection and naivety leads him to a position where the greedy capitalist CEO John Scully (Matthew Modine) forces him out, causes a personal crisis for Jobs and a corporate crisis for Apple. Years later he's called back, annoints his design successor Jonny Ive (Giles Matthey) and announces the design of the iPod. The rest is final credit success and deliberately avoided death. I'm no expert on Apple's corporate history so I can't tell you if the account is broadly accurate and fair, but it IS compelling, if a little bit TV movie of the week. And that's how I'd advise you watch this: on the small screen. 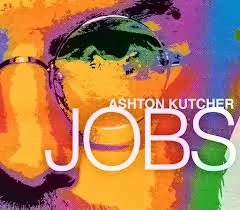 JOBS has a running time of 128 minutes and is rated PG-13 in the USA. JOBS played Sundance 2013 and was released earlier this year in the USA, Singapore, Canada, Turkey, France, Argentina, Kuwait, Portugal, India, Pakistan, the Philippines, Australia, Israel, South Korea, Brazil, Poland, Belgium, Denmark, the Netherlands, Iceland, Croatia, Serbia, Thailand, Estonia, Greece, Hong Kong, Finland, Lithuania, Spain, Taiwan, Colombia, Latvia, Mexico, Bangladesh, Macedonia, Japan, Norway, Peru, Sweden, Italy and Chile. It does not yet have a UK release date.